Say Hello to Wicker Man! – TowersStreet - Your premier Alton Towers guide! 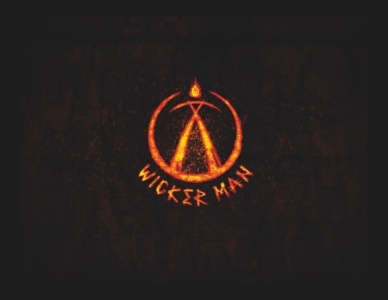 TowersStreet » News » Say Hello to Wicker Man! Say Hello to Wicker Man! With 2018 upon us and the new season now just months away, Alton Towers have officially revealed the name of their new wooden coaster, code-named Secret Weapon 8. Wicker Man is scheduled to open at the start of the resort’s 2018 Season on Saturday 17th March. The ride is located on the former site of the iconic Flume ride. With demolition of the old water ride starting back in November 2016, guests watched throughout 2017 as construction of the new rollercoaster took place. 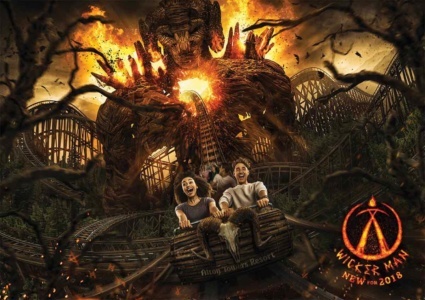 Built by Pennsylvania based Great Coasters International (GCI), the resort have promised Wicker Man will be a ‘world class attraction’, offering not just a ride but a full experience from start to finish for thrill seekers who dare to ride. Hints toward the ride’s theme and name have been seen in recent months, most notably by the park’s newest scare maze during their 2017 Scarefest event. ‘The Welcoming: Be Chosen‘ allowed guests to interact who we now know to be The Beornen, a group who have shunned technology. The maze was based around the group’s Halloween festival, celebrating the crossover between the living and the dead. Whilst the announcement has been a long time coming, the name and theme is not necessarily a surprise to some. A series of teasers released by the park as well as glimpses of the huge central theming structure have also pointed toward a pagan theme, with the ‘Wicker Man’ name being spotted on a European Trademark website late last year. We’ll be bringing you more updates and extensive coverage of Wicker Man as we progress toward the opening of the ride in March. In the meantime, check out our forums for further discussion, and of course our Facebook and Twitter pages.